The Mutiara Johor Bahru is an iconic business hotel situated minutes from the citys central business district -shopping centers and places of interest. The hotel is only 15 minutes from the Causeway to Singapore and 40 minutes from the Sultan Ismail International Airport. As a premier business hotel -Mutiara Johor Bahru understands your need to be efficient in dealing with everyday work and that is why our 336 rooms and suites have large work space - high-speed Internet access and modern comfortable furnishings for when you want to rest after a busy day working. Mutiara Johor Bahru has exceptional service. Your stay is important to us and we make sure we are attentive to your every need. Our staff is always ready to handle an individual request or cater to a function of hundreds in our ballroom - Dewan Johor. The ballroom accommodates up to 380 persons for banquet style seating and 500 persons for theater style seating.We have one of the best dining experience in the Malaysia. For two generations Meisan Szechuan Restaurant has wined and dined the creme de la creme of Johor Bahru and in 2011 it received the acclaimed Malaysias Best Restaurant Award. For other options we have Seri Mutiara serving up local delicacies and The Capri for continental cuisines. Cancellations received within 24 hours of arrival date- a cancellation fee of 1 night will be levied - in event of no show first night will be charged. Exceptions may apply- please see rate rules. Largest Meeting Room Size: 248 sq. ft.
We stayed for 4 nights and had no complaints. Our highlights would be the breakfast menu with full of delicacy. Definitely will come back! Hotel is old, but well refurbished. Location is 9 minutes walk to KSL City. Got it for a good rate through Agoda (~$150RM) per night; cheapest among the area. Room is extremely spacious and clean. Service was good and staffs always have a smile on their face. Had a pleasant stay and would definitely return. Would also like to thank the front counter staff, Irene, whom did our check in and check out. Her service was fast and efficient. The building is old but the interior is up to date. Honestly, the management need to refurbished the outside building and do some landscaping. The swimming pool need to be cleaned and touch up. The food is good and plenty of choice. Second time I stayed at this hotel and I love it. Polite staff and very responsive. Service is good. Special mention of the manager Shukrie and Irene at the reception counter who were very helpful. This hotel has been in existence for more than 20 years. Still well maintained although needs an upgrade to keep it current and updated. The lobby is still presentable and the room rates are reasonable. The jockey service is cheap by most standards at RM5.00. Great experience. Stay for 1 night. Check in is fast & breeze. Room is big than expected . But furniture looks old & needs a refurbishment. Breakfast has wide selection. From western to local dishes. Delicious. Weekend hi tea is value for money. Wide spread of Western & Asian cuisine. The ladies restroom has poor ventilation. Musoolah is clean though. Great room after the refurbished, breakfast is still good. Parking is not very convenient due to narrow road. Amenities is basic: fitness center, pool, gift shops, business center and basic wifi. Good location. Relatively cheaper than nearby hotels. Clean and comfy. Safe, sheltered parking for motorcycles. Free wifi. But gym, pool and other amenities are average. I've been to the hotel many times for their buffet. The food spread is pretty good. From local to western dishes. Staff are very friendly and helpful. If there is something you tried before but isn't there at the moment. They have helped me make it, so that I would enjoy it. I didn't expect it until I received it by one of their lovely staff. Extremely good experience with this hotel, clean and safe, organized and efficient, most importantly the staff were all friendly and smiling, from security at door to receptionists and restaurant staff. I surely will consider come back. Thank you! Food are good, we get a buffet breakfast. The place is clean, our room was clean and with above average amenities. Staff was very helpful. We forgot our keys in room and they lend as another one. I like also the 2 meter deep pool though diving is not allowed. Great experience. Stay for 1 night. Check in is fast & breeze. Room is big than expected . But furniture is looking old & needs a refurbishment. Breakfast has wide selection. From western to local dishes. Delicious. Stayed here for a weekend. Was upgraded to a Deluxe room with 2 Queen beds. Check in process was easy and fast. Comfortable room, plush pillows. Great selection at breakfast. Wonderful and helpful staff. Room looks bit old. Swimming pool not very clean. Customer service is good. Easy to reach Holiday Plaza Mall as just side building only. KSL mall is in walking distant and able to reach. Overall is good. Stayed one night. Great staff serving me over the counter. Had a free upgrade to suite as I checked in extremely late that night. Room was clean neat and tidy. The hot water for shower can be improved as the water was not hot enough to my preference. I will recommend for people who are staying for a short trip, going for a shopping trip over the weekend. Value for money as compared to KSL hotel. Nice clean hotel with big rooms. Beds were extremely comfortable. Friendly and accomodating staff. Breakfast selection had a wide range of local fare. Gym and pool well maintained. Overall great experience. Only downside was it's a little walk away from malls and restaurants. Booked a Mutiara Club room. Cleanliness was reasonable. The room is clean except for a couple of hand towels and 1 bath towel. There are stains on those towels but replacement came fast. Wall between rooms are rather thin. Breakfast spread has a decent variety of food. Very spacious room! Room & bathroom are clean and generally well maintained despite the dated look of hotel's external facade. Big bathtub is a plus, overall good value for money. Buffet food are great! Variety choices of food available, staffs are friendly and courteous. A nice place to attend event. The exterior is quite deceiving. The interior looks much better. During check in, the staff was friendly and helpful. Even though there was a slight mistakes in the booking, he helped to correct it. I was unaware of the 200rm deposit but I booked via Agoda so it might not be their fault. However, I wasn't informed that there will be a tourism tax that would be deducted from my deposit. I only realized that when I did not receive the full deposit return upon checking out. The pillow covers had some stains and the toilet was slightly dirty, probably due to old age. Other than that, I have no complaints for the room. Service is fair, rooms large but cleaning is questionable. Old property they are trying to make into something its not. No way to control air condition just ice cold or off and A/C runs when key card is out, reguardless if off or on. Location is good. Just besides holiday Inn and a stone throw away from ksl mall. Staff is friendly. Very well located. Clean with good ammenities. Close to KSL. Reasonable pricing. Nice big room. Facilities are ok. The only setback is the shower,only have a handheld one in the tub.Full shower head is preferable. Breakfast buffet is quite good. Big room. Nice place. Can get a smaller room mext time and enjoy breakfast the same way. Big Rooms with bathtubs @ fantastic rate. Shopping at Holiday Plaza next door and KSL nearby. Hotel have a spa with full body massage at rm85. Affordable accomm with decent location - KSL no more than a 10-minute walk away. Hotel is a little old though. Don't expect ace amenities. Good enough for what you're spending. Chinese restaurant on the second floor is quite good! I have stayed here many years back. It's good to know it is still good, though could be better. Room is spacious and clean, but the power sockets could've been better. Service wise is good. Location is good though the neighborhood could be better. Walking distance to KSL shopping where Tesco is located with plenty food available. One of the better hotels in JB. Looks quite rundown from the outside but the inside is quite well done up. Staff are friendly and helpful. The food is quite good. I had a room on the 11th floor and it was nice and comfortable. The bathrooms could use a bit of sprucing up. An older hotel but quite newly renovated. Great service and staff so far. No swimming pool or sauna. Didnt try the breakfast buffet as the room daily rate is pricey with it. Right next to holiday plaza for luxury imitation goodies. Would have given a higher rating if the price was more fair. But still would recommend for those busy travelers. Easy check in check out. Staff are polite and friendly. Though the hotel is not new, the room we are staying was well maintained. It will be better if the pool and fitness centre's surrounding could be upgraded. Not the most modern hotel but it feels like home away from home. Friendly staff. Good management. Outside look....a bit old...but inside, the cafe and the room is super nice! 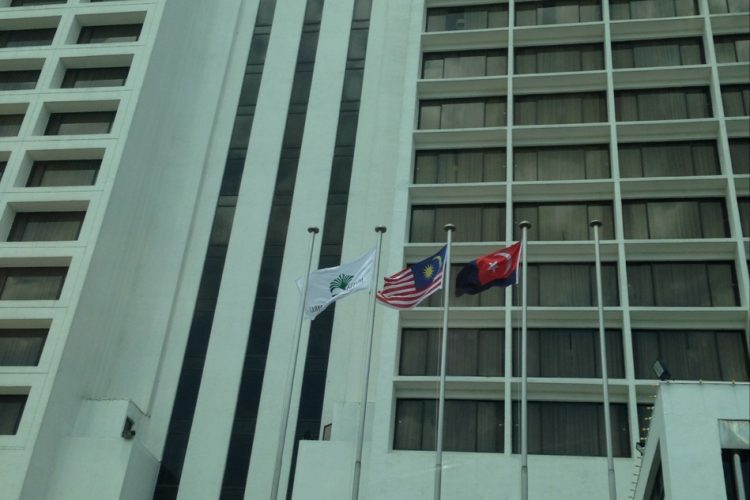 Maybe one is the oldest hotels in JB but still well maintained. Spacious room, clean sheets and full toiletries set (toothbrush on request). Good value for the price paid. Conveniently located. Don't bother with the shopping mall next door. Dodgy. For an older establishment, the room is decent, clean and spacious albeit a mild rustic feel. Breakfast range was not bad either although most leisure travellers would opt for local fare in the vicinity. Location is the pros. From massages parlours and shopping mall areas. Only halal Cafe or restaurant that doesn't come across. Other then that, is good. Real Real good location and very good service. Not crowded. Great breakfast buffet spread. Though some may find the hotel a bit jaded. Love to stay here as breakfast spread is good. Staff are polite & helpful. Rooms are clean & spacious. Beds are comfy & big. Very spacious. Ate there for breakfast and was not disappointed. Free wife and great service! Clean hotel with strong wi-fi and gd service. Not a fancy new hotel, it is a hotel with its own style. A little luxury, a little nostalgic. The room is very clean and comfortable. It is also very convenient that there is a Parkson Holiday Plaza next to this hotel, and a KSL mall nearby. Old building but next to holiday plaza shopping mall and opposite main road has spa, car wash, seafood restaurant for (Chinese), etc... F&B - good. Pub bar at 2nd floor. Swimming pool at 3th floor. Best part of this place that I never miss coming here on Chinese new year to see fireworks and spa. Wifi portal login is mutiara for both login and password. More like budget hotel. Small pool. Had not been there quiet smtimes but SERVICES still EXCELLENT! food of cos v good! Best in Jb!